Crew 133 members Matthieu Komorowski (left) and Joseph Jessup setting up a radio telescope just outside Utah's Mars Desert Research Station. In the background is the facility's astronomy observatory. HANKSVILLE, Utah — Walk across the fall line, knees bent, back straight. Lean into your back foot. Remember not to go tumbling off the hill while inside the spacesuit. As I repeated this mantra Jan. 8, wedging my feet into the side of a steep hill, a bit of magic happened: I felt secure. Despite the fact that only the left side of my feet were on solid ground, I realized there actually is a way to walk safely down the side of a mountain. Crew 133 members Matthieu Komorowski (left) and Joseph Jessup walk towards the next stop on their geologic research tour near Utah's Mars Desert Research Station. I leaned heavily on the help of fellow Crew 133 members Gordon Gartrelle, Matthieu Komorowski and Joseph Jessup — sometimes literally, as one of the experienced hikers would extend a hand to help me up or down a steep slope. Our purpose was not to thrill-seek, but search for geological formations for two research projects. The site of MDRS, which is about four hours south of Salt Lake City, was obviously an ocean in the past. One steep scarp near the habitat led to a plain that was filled with fossilized shells. The mountains show signs of sand building up in layers over time. Jessup, with navigation assistance from Komorowski, was trying to find geographical locations in the neighborhood that he previously identified through aerial photos. Jessup has a geology project that is seeking to figure out elevation data of layers of rock. He pointed out that many of the hills in the area appear to be about the same height, implying that level was the ancient ocean floor. 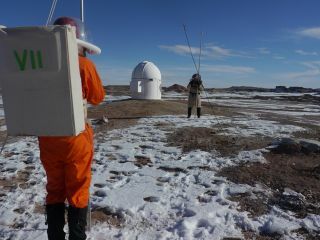 Crew 133 executive officer Gordon Gartrelle during a "Marswalk" near Utah's Mars Desert Research Station. Gartrelle was seeking evidence of ancient hydrothermal vents. Meanwhile, Gartrelle was on the hunt for orange soil, which we found in abundance up the scarp, running almost like a river along the edge of the cliff. Orange is a probable indicator of iron, and iron is considered a possible marker of ancient hydrothermal vents in the region. Our 4.5-hour "Marswalk" took place in two parts. The purpose of the early-morning segment was to set up a new radio telescope just outside of the "Hab", or habitat where we are spending two weeks simulating exploration on the Red Planet as closely as possible. We learned how valuable tools lists and procedures are when we realized, a few minutes into the work, that a bag of screws was missing. It took some hunting to find them. Jessup made a few extra trips back to our "airlock" to pick up more equipment as we needed it. The ground was frozen as my crewmembers pounded stakes into the ground, making it difficult for them to erect everything correctly. With patience and persistence — one stake took three separate crewmembers to drive in — the bones of the telescope were put up in a couple of hours, about an hour longer than we had expected. After a water and food break, we re-emerged for what ended up being a 2.7-mile (4.3-kilometer) hike. Our adventure didn't end when we got back, however: the Hab's main power generator failed, requiring a call for help to get a backup reactivated an hour later. While we work to simulate Mars exploration as close as possible, a hard mission rule is a power failure requires a phone call. For safety reasons, of course.